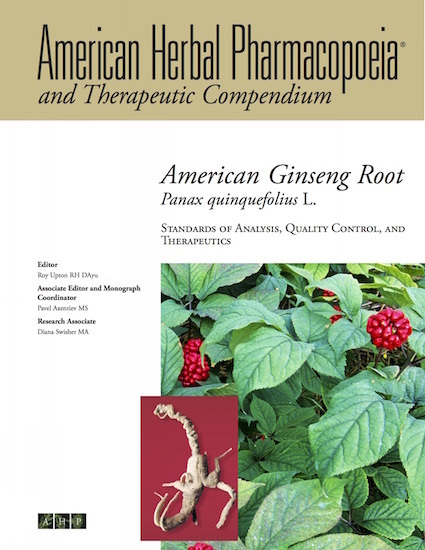 American ginseng (Panax quinquefolius) root is one of the most widely adulterated herbs available on the Western herb market. We have found leaf material marketed as root, exhausted marc being sold as crude root, and materials cut with 45% dicalcium phosphate. Suppliers should be aware that if the price is too good to be true, it probably is too good to be true. The AHP monograph provides all of the characterizations that any quality control team requires for making an authentic and quality product, and allows for the differentiation between Panax quinquefolius, P. ginseng, and P. notoginseng. The Therapeutic Compendium provides a detailed review of the available clinical and preclinical literature highlighting the use of American ginseng for its blood sugar-lowering, immune-modulating, anti-inflammatory, cardiovascular, anticancer, and adaptogenic, among other effects. Of particular interest is a safety concern regarding the potential of ginseng to positively or negatively interact with conventional hypoglycemic and anticoagulant medications. The available data are presented.